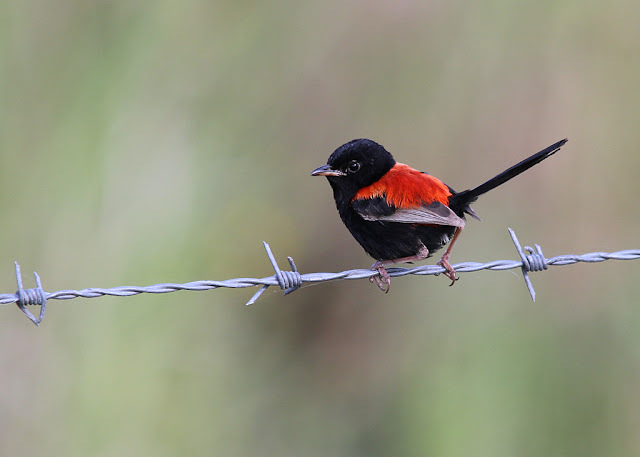 Red Backed Fairy Wren and Superb Fairy Wren, What's the Difference? This little bird is the smallest of the wren species in Australia. In fact it’s smaller than a sparrow and because it’s so small, that it’s called the Elfin wren. The males of course have all the colour being a glossy black with a scarlet patch, while the females are brown. They can't be mistaken for a sparrow because they're smaller and have that characteristic pointing up tail, bouncing around like little ping pong balls. Let’s find out what’s great about this bird. The Red Backed Fairy Wren is smaller and shyer than the Superb Fairy Wren , but has a similar call. Female Red Backed Fairy Wren, not red at all. Most of us won’t see this Fairy Wren because Red-backed Fairy-wrens are essentially birds of Australia's north where they are mainly restricted to the more humid zones closer to the coast. In eastern Australia they do extend south all the way down the NSW north coast to near Newcastle and in W.A. south to Cape Keraudren, again along the coast. Apparently they’re common around the outskirts of Brisbane and Darwin. 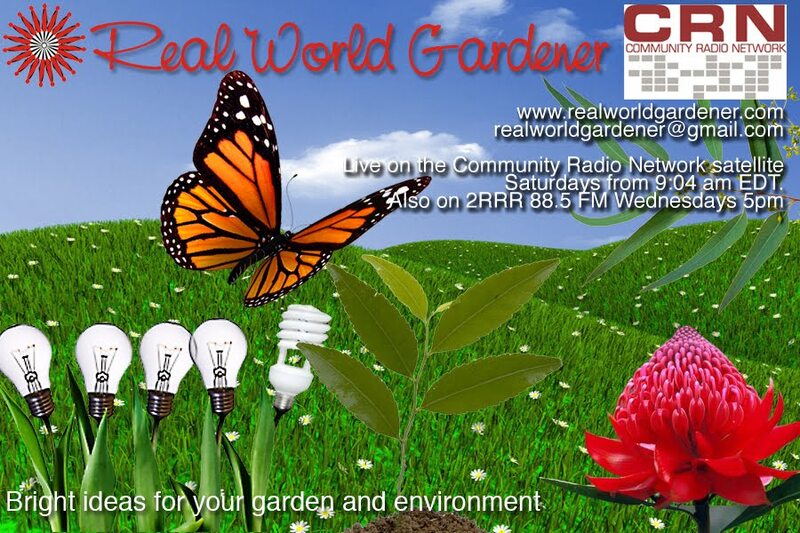 If you have any questions about Red Back Fairy Wrens, drop us a line to realworldgardener@gmail.com or write in to 2RRR P.O. Box 644 Gladesville NSW 1675. Making Your Own Seed Tape, seed mats or discs is today’s topic. Would you believe that it was only twenty-plus years ago, several seed companies started making and selling seed tapes - Seed tapes are strips of dissolving or quickly decomposing material that have imbedded seeds spaced at regular intervals. They’re used to make dispersal and spacing of difficult-to-handle seeds . The tapes also make it easier to make straight rows. Planting seed tapes or mats is easy because the arranging of seeds is already done, or if you are making your own you can do it indoors. Is it only for beginner gardeners? Seed tape has several advantages. No seed is wasted; the seeds are embedded into the paper tape one at a time and are perfectly spaced and ready to go into the garden. This also means that no thinning is required. They’re especially useful for tiny seeds which can be difficult to plant such as radish, carrot, lettuce or parsnip. Just about any seed can be put onto a seed tape, however, so if you wish to make one with larger seeds, there’s no stopping you! Seed tapes also stabilise the seeds positions in the soil, keeping them in place even when they are hammered by heavy rains. And, if you cover seed tapes with weed-free potting soil, the seeds can germinate with no aggravation from weeds. Several seed companies in Australia sell a variety of seeded tapes that are incredibly easy to plant, or you can make your own. That’s right, gardeners can make their own seed tapes! Seed tapes are long and skinny, and intended to do a superior job of spacing seeds uniformly in the row. 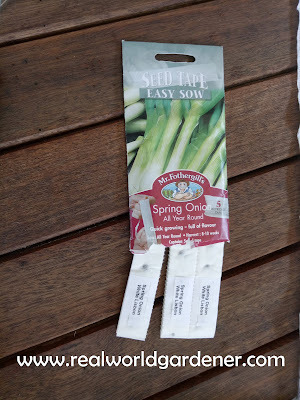 They do this quite well, although some experienced gardeners have said that the seeds on most seed tapes are too close together. This may be true for some crops, like radishes, but not for small, slow-sprouting carrots. How to make this tape then? You can use unbleached toilet paper to make my seed tape. I think that paper towels or even newsprint would work as well, although I haven’t tried them. Begin by mixing approximately 2 Tablespoons of white flour with 1 Tablespoon of water to make a thick paste. This will act as the glue to hold the seed in place. You don’t want this to be watery and thin because you want it to dry quickly so that the seed does not have a chance to absorb the water. Unroll the toilet paper until you have about 1 metre of it are lying flat on the table in front of you. Fold the toilet paper in half the long way, and then unfold. You’ll be placing the seed in the middle of one half of the toilet paper (about 2.5 cm or 1″ from the edge of the toilet paper). From the seed packet, figure out how far apart you need to space your seeds. Don’t use the distance given on the packet for planting – use the distance that the packet suggests for thinning. For carrots, I placed my seeds 5cm apart. If it helps, you can use a pen or marker to mark the spot on the toilet paper where the seed will go. Now, dip a tooth pick, cotton bud or artists paint brush into the flour paste to get a small amount of paste on its tip. Use this to pick up just one seed. Sounds fiddly I know, but be determined. You can do it. Using a ruler as a guide, place the seed onto the toilet paper at the proper distance apart for the seed you are working with. When you’ve “embedded” all of the toilet paper, add a few dots of your flour paste every few cms near the edge of the toilet paper and fold the toilet paper back in half. Rub gently to allow the paste to glue the two sides of toilet paper together. Continue working in the same manner until you’ve used all your seeds, or until you’ve made as much seed tape as you need. Be sure to leave the toilet paper spread out until the paste is completely dry. Write the name of the seed on one end of your seed tape, and then you can roll it up and store in a cool, dry spot until you’re ready to plant. The faster it dries, the better, since you don’t want the wet glue to trigger germination (it shouldn’t be wet long enough for this, but better safe than sorry). 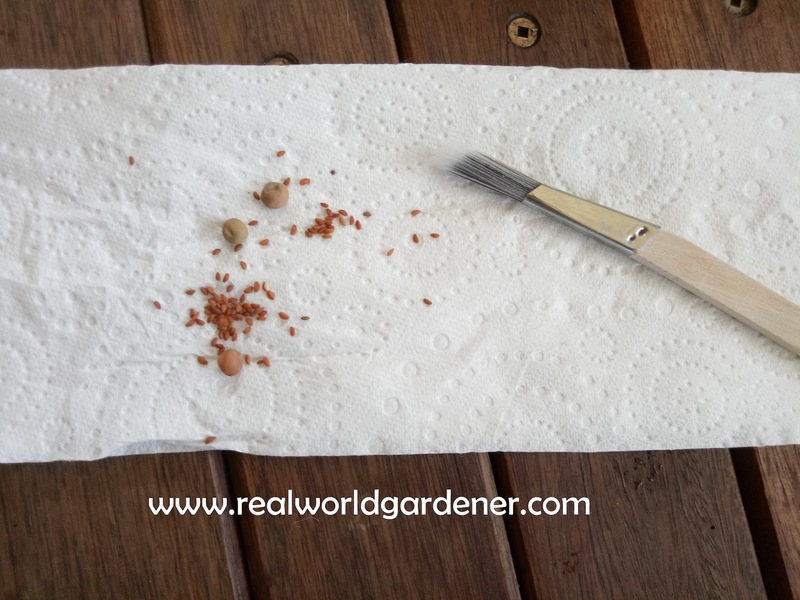 When dry, roll them up and store them in plastic bags, along with the seed packet, until it is time to plant. Now your tape is ready to use! 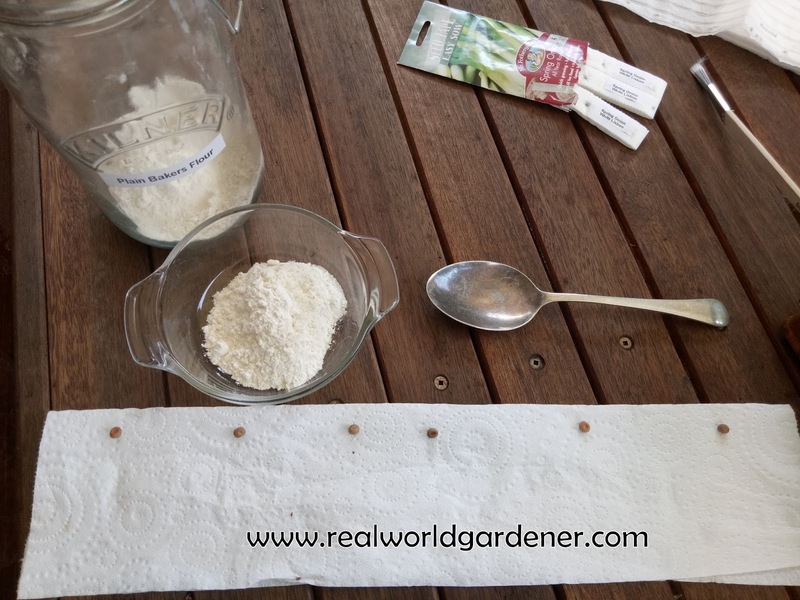 I heard of other gardeners making their seed tape using paper towels and the flour and water glue. Just make a paste of flour and water and spread a thin layer of it onto the paper towel. Then put the seeds on and a second layer of the towel. Works great and the paper towels hold up just a little bit better than the toilet paper. You do have to make sure you dry it well after making it if you aren't going to plant immediately, but that usually just takes a day out in a dry place. Use your seed tape in long flower boxes, raised beds, or right in the garden. All that you have to do is dig a trench the recommended depth for that seed, lay the tape down, cover with garden soil and water gently. The paper biodegrades into the soil as the seeds germinate and grow. For best results, be sure to keep the seed consistently moist. Do you have fruit trees in your garden? Citrus are fruits so you probably answered yes to that. So what do you do when the fruits all come ripe at once? 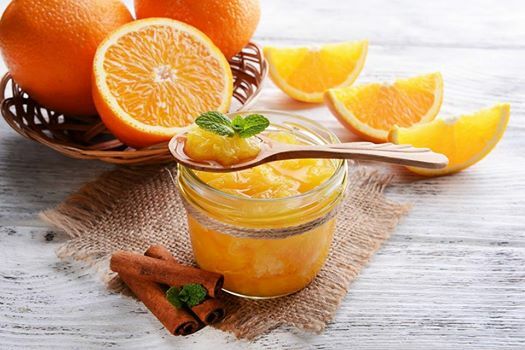 Jams and preserves and possibly pickles are the first things that come to mind for most people, but there are a lot more methods of preserving fruit to use later on in the year. Let’s find out about this preserving business. I hope that’s inspired you to try several different methods of preserving your fruit. We didn’t even cover making pasta sauce with all those tomatoes that you’re growing right now. Have you ever been to see the wildflowers in Western Australia? In the wild, these fast-growing annuals perform brilliantly under extreme conditions. They germinate with the first rains in winter and by late August are in full flower, adding bright colour to the otherwise harsh landscape of outback Australia. 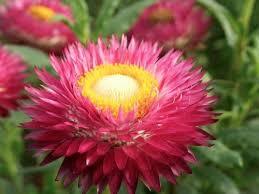 Here’s a tip to keep those everlastings for longer in the vase. The trick is to pick the flowers when they are young and just opening. Then hang upside down in a cool, dark room. Once dried, the stems can be trimmed and they can be placed in vases or you can replace the stems with florists wire. If you pick the flowers when they are fully open the petals will fold back towards the stem and the flowers will fall apart.